The Burnley Meet by Charles Augustus Henry Lutyens R. A.
Charles Augustus Henry Lutyens (CAHL) was a member of an illustrious family with numerous connections to the British Army. His parents, who were married on 6 May 1824, were General Charles Lutyens (1773-1848) and Frances Jane Fludger (1789-1850). His father was appointed Deputy Commissary General of the Army, a civilian appointment responsible for military procurement. He also served on the staff of General Moore in the Peninsular Campaign and wrote an impressive journal recording the horrors of the ill-fated Retreat on Corunna, escaping from Napoleon’s General Marshal Soult. CAHL was born at Southgate House, Reading. CAHL married Mary Theresa Gallwey in Montreal, Canada in 1852. Mary was born in Killarney in 1833 and died in Surrey in 1906. She was the sister of Sir Thomas Gallwey, the Governor of Montreal. A deeply religious woman she had few interests outside her evangelical faith. Mary bore Charles thirteen children, including the celebrated architect, Sir Edwin (Ned) Landseer Lutyens. CAHL was a close friend of Sir Edwin Landseer, hence the names given to his architect son. He was an infantry officer serving in the XXth Foot (which became The Lancashire Fusiliers), an artillery officer and later a sculptor, a painter of portraits, animals (particularly horses) and sporting scenes – racing and hunting. He exhibited between 1861 and 1903, showing at the Royal Academy, Royal Institute of Painters in Water Colours, British Institution, Grosvenor Gallery, Dudley Gallery, Royal Hibernian Academy, Manchester City Art Gallery and the Society of British Artists, which elected James Whistler its President in 1886. He was a member of the Burlington Fine Arts Society and supported Whistler when he was expelled in 1867. Among the most famous and well-known of his artworks, showing his detailed understanding of a horse’s musculature, is Avontes and Groom in a Stable Interior. Other works included paintings of many of the horses of King Edward, the Duke of Westminster and other notable owners. His portraits of King Lud, Cremorne, Going Forward, Mary Stuart, Doncaster, Galopin, Blair Athol, Blue Green, Spring Field, Sefton, Isonomy, Carrieroy, Janette, Florizell 2, Persimon, Gallinule and Volodyosky demonstrate his love of horses and artistic talent. He first created clay models of an animal from which he made a drawing and then after a quick comparison produced the final painting. CAHL wrote at least two published books. 'The Venetian Secret', published by Digby and Long, is an easy, entertaining read. The book centres around the discovery of a missing treatise purporting to describe how, in the 1600s, the Venetians invented a new painting technique which had been kept secret over the centuries. The big question is whether this technique has been used by an artist character in the book. A touch of the detective and mystery! The book has been scanned and can be read online through the British Library website. It features detailed descriptions of hunting and country sports as well as the dynamics of an artist’s studio. Horses and hounds are major features. A second book, which is also available on the British Library website, is a biography of CAHL entitled 'Dogs and Horses' written by his son, Frederick M Lutyens, and liberally illustrated by CAHL with simple line drawings within the text. These two books clearly express Lutyens love for hunting and the Sporting Life and makes an appreciation of his paintings all the more compelling. As mentioned earlier, CAHL served as an officer in Canada, joining the 20th Foot as an ensign in 1848. When the regiment arrived in Montreal the officers discovered that the Military Pack, which had existed since 1826, had been advertised to be sold in New York. They at once lodged an objection and took over the hounds, horse, cottage, kennel buildings and a field. The horse, a splendid stallion, had been brought from England by Lord Durham. Some years later his descendants were presented with the field and buildings. A plaque in the Clubhouse of the Montreal Hunt records 'Captain Charles Lutyens - Master 1851-2'. CAHL, who returned to England promoted, was one of the first officers to attend the newly established school of musketry at Hythe and was appointed Instructor of Musketry to the regiment. After his death the 20th Regiment magazine recorded the splendid tale of his exploit, whilst instructing at Aldershot, when the hounds passed by. In full dress - tunic, shako and sword - he sprang onto his horse and joined the chase, leaving the somewhat amused Companies to their own devices. He was later appointed District Inspector of Musketry in SW Command. He was inventive and designed the 'Stadiometer', a reflecting instrument for measuring distances which was used by the army for nearly 40 years. CAHL lived in Onslow Square, London, close by Edwin Landseer, for many years and later retired to Thursley in Surrey. His wife bore him 14 children of whom one died stillborn and two died in early age. The 8 boys and 3 girls all grew up to become distinguished themselves in some way - architecture, soldiering and the arts generally. In spite of detailed research it has not been possible to locate the 'Burnley Meet' but it has been possible to uncover fascinating detail about the characters depicted and in particular the person who commissioned the painting. The Lutyens family archives include the 'Commissions Book' in which CAHL recorded his works by year, showing the amounts charged. In 1875/76 there are entries relating to 'Hargreaves', totalling £600, which mention the creation of a second copy of the painting. 'Hargreaves' has been conclusively identified as Colonel John Hargreaves who owned homes in both Accrington and Maiden Erleigh, Berkshire. 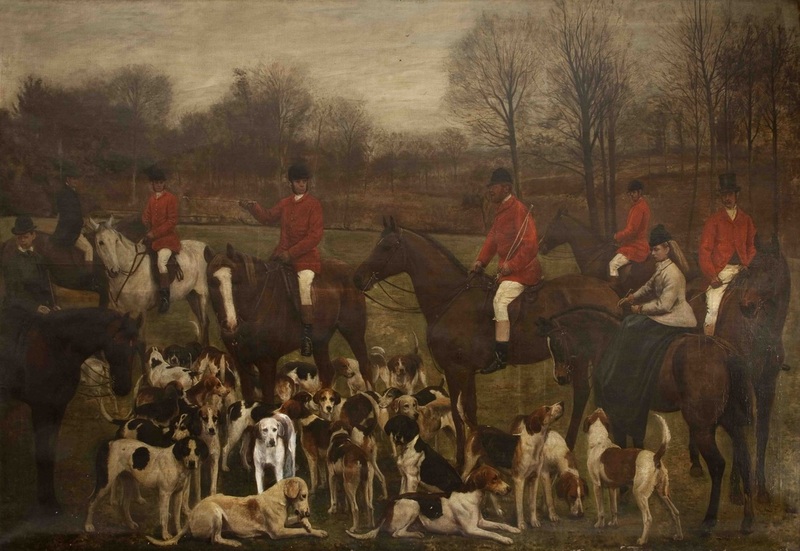 The Colonel was Master of the South Berkshire Hunt, now absorbed into the Kimblewick Hunt, for 22 years until 1877, but he was also Master of the Pendle Forest Hunt, now amalgamated with the Craven Hunt to become 'The Pendle Forest and Craven'. The Hunting Diary of Colonel le Gendre Starkey, a former Master of the Pendle Forest Hunt, records a meeting of the hunt subscribers at the Black Bull in Blackburn. Hargreaves is listed as being present. The History of the Pendle Forest & Craven lists Colonel J Hargreaves as one of the early Masters. It may be that a copy of the painting was made to provide one for both his Lancashire and Berkshire residences. Who then was Colonel Hargreaves? The 'Hargreaves' family were extremely successful and wealthy business people who made their fortune in Accrington and East Lancashire. The family owned the largest firm of calico printers, 'Broad Oak Printworks', employing hundreds of people in Accrington. Colonel Hargreaves' father bought property in Berkshire and the Colonel met his wife there. She was Mary Jane Cobham of Shinfield Manor, Berkshire. He was well known in East Lancashire as a leading Tory and benefactor. He had interests in coal mining and from 1866 until 1895 owned Whalley Abbey, which he passed to his eldest son, John, who sold it in 1900. Interestingly, his nephew, Reginald Gervis Hargreaves, a fine cricketer who played for both Hampshire and England, married Alice Pleasance Liddell, the real life Alice in Wonderland on whom Lewis Carroll based his stories. The Hargreaves name is even now still associated with the coal industry through the AIM listed company, Hargreaves Services plc, who operate Maltby deep mine in Yorkshire and open cast mines. John Hargreaves was born in Accrington on 30 August 1839 and died 3 October 1895. He was educated for a commercial career, joining the banking house of Brown Shipley, of which his grandfather was the principal, at the age of 16. However, he soon tired of business life and spent most of his time at his lovely mansion, Maiden Erleigh Hall, purchased in 1878, whilst retaining, from 1873, Broad Oak House as his Lancashire home. He was a JP in both counties and in his earlier days took a major interest in the Volunteer Movement, gaining a commission in 1859 and becoming Honorary Colonel of the 3rd LAV and Honorary Major in the Berkshire cavalry. In due course he was created Major in command of the East Lancashire Regiment, a position he held until 1873. Alice Liddell Hargreaves, who lived in the south, retained a tenancy over Oak Hill in Accrington until her death in 1934. The family data included above has been drawn from the website of 'The Family History Trust'.